Muzandzeni is a peaceful picnic spot, situated next to a seasonal stream in the shade of tall trees. It is unsophisticated and small, with a drinks kiosk, which also rents out gas cookers on which you can cook your sizzling bushveld breakfast. Being small it is never overcrowded, and it makes a pleasant break from driving around looking for game. 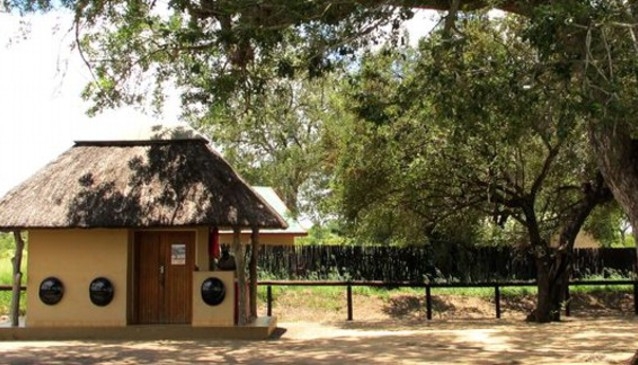 Kiosk with cold drinks, picnic tables, and gas cylinders for hire. Tables in the shade of trees. The Shimangwaneni Dam, with a resident lone hippo, is about 2km further South on the S36, and is a good place to sit for a while to watch the game as it comes down to drink. It is not unusual to see lion in this area. Situated about 1km south of the S36 and the S126 (the Sweni River Road), within easy access of Orpen 35km/2hr, Talamati 23km/1hr, and Satara 30km/1.5 hr.